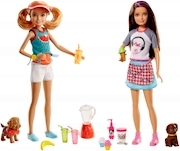 Launch play with Chelsea™ dolls and accessories that let the youngest sister of Barbie® launch her own businesses -- and bring her pet along for the company! Choose from Chelsea™ doll with a puppy shop or Chelsea™ doll with a popcorn stand. 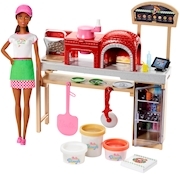 Each play set features a 5.5-inch doll, a smaller sized pet figure, a shop piece with working feature and themed accessories. 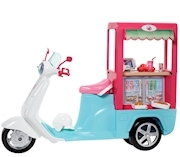 Each shop's action is activated by a simple mechanism kids can easily use: simply flip the plate with doggie treats to change the display on the puppy shop counter or move the lever on the popcorn stand up and down to see the popcorn "pop" inside the popcorn machine. It's so much fun, and the action inspires laughter and repeat use! Each set also comes with a small box in which the pet fits, and their adorable poses are perfect. Chelsea™ doll looks just as sweet wearing bright colors with a removable skirt and shoes. An additional piece (like a serving of popcorn or a dog bone) helps to expand playtime. Young imaginations will have so much fun telling so many stories. Collect all of the Chelsea™ dolls and accessories for even more possibilities because with Barbie®, you can be anything! Includes Chelsea™ doll wearing removable skirt and shoes, large accessory with working features, a pet, a pet box and a themed accessory. Colors and decorations may vary.